Advances in sporting equipment usually revolve around new materials and radical hybrid constructions. MSC.Dytran simulates the impact of a bat and baseball. The simulation is used to identify stress and indicators of dynamic performance, and predict durability. After making contact with a baseball, a bat bends, often showing two nodes (dark blue areas) or points of nondisplacement. The node on the barrel is the bat's sweet spot. Finding the coefficient of restitution for a digital "baseball" required adjusting ball-material parameters in MSC.Dytran so they match physical test data. Despite the material advances, some manufacturers still take the build-testbreak approach to evaluating designs. "This antiquated approach relies on prototypes and subjective user evaluations," says Martin Martinez, president of Engineering Science Analysis Corp., Tempe, Ariz. (esacorp.com). "Worse yet, it provides no way to bypass the competition nor maintain a market lead. And it does little to help engineers understand performance margins that may or may not exist in the design." Although a manufacturer knows a product passed the test, it is not understood by how much. " Knowing the margin can yield valuable insights to the performance as well as the possibility of future enhancements. Such insights can also lead to new derivatives or determine what design changes will meet the rules and regulations on product performance. What's more, there is increasing pressure from the market to turn out new sports gear every few months," says Martinez. "Durability is key to product recognition and manufacturer reputation. Failures in the field can hurt consumer perceptions and may even bring down a brand name. A product-design team that needs numerous prototypes and tests to assess durability loses its competitive edge," he adds. Martinez says the Impact Sports Div. of his company has been helping sporting-equipment manufacturers sharpen their competitive edge through Virtual Product Development (VPD). The company uses simulation and product-development techniques, tools, and processes used in aerospace industries that are easily adaptable to impact sports. Applying VPD to develop a baseball bat shows how it pays off. "For instance, the impact between a bat and ball is a lot like a crash," says Martinez. "It's a violent and highly nonlinear dynamic event. It lasts only milliseconds, yet produces transientdynamic loads in the bat that send displacement and stress waves through it to the user. The simulation's complexity is compounded by the baseball's inherent viscoelasticity. A lot happens in the short period of an impact, so the event lends itself to simulation where dynamics can be slowed and replayed for detailed analyses." Simulation of transient-dynamic loading requires specialized simulation tools, 3D explicit solvers, such as MSC.Dytran. Until a few years ago, such tools were only used in aerospace, defense, and automotive industries for short duration events such as crashes and impacts. Simulation starts by creating and calibrating a baseball model to ensure realistic impact conditions. "To do this, we made a ball using MSC.Patran, a pre and postprocessor for MSC. Nastran, MSC.Dytran, and other widely used CAE codes. Using the explicit solver, we solve and calibrate the ball's impact data on a rigid plate. 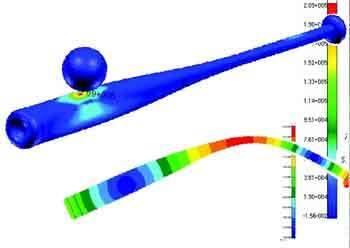 The ball modulus is plugged into a constitutive material model within MSC.Dytran, which accounts for elastic and viscoelastic properties. Using the acquired modulus, viscosity constants are adjusted until the coefficient of restitution (COR) constants match that of test data," he says. At this point, the bat model (a virtual prototype) is constructed using the preprocessor. It lets us assess new geometries, mass distribution, and advanced materials or hybrid structures that use composites as well as metals. Components such as the cap, knob, and even urethane fillers can be included in the model. For composite constructions, the software uses the preprocessor's laminate modeler to handle laminate plies and fiber orientations," says Martinez. Before impact analysis, bat ergonomics are assessed with the model. "Here, modal analysis is conducted on the bat model provides resonant frequencies and mode shapes. Comparing modes from one design to another shows how changes and materials affect the bat's dynamic response which affects user comfort," says Martinez. "Ideally, vibration nodes of the first bending mode should be at the hitting location and grip area. There is no vibratory displacement at a node. Bats usually show two nodes in bending, one about midbarrel, the hitting location, and one at the handle. A straight line between these two locations should approximate the bat's undisplaced centerline," he says. A node at the hitting location more effectively transfers the bat's kinetic energy to the ball. "The node identifies the bats center of percussion, it's sweet spot. A node at the grip makes for a better feel because it minimizes vibrations felt by the hitter. The natural frequency can be correlated to the sound of the bat during impact, which may not affect the bat's performance, but it's often a consumer perception of performance," adds Martinez..
After ergonomic simulations, virtual impact analysis and testing begins using the impact software and the previously developed ball model. Simulating bat and ball impacts also results in time-dependent dynamic stresses, displacements, and animations. "A stress wave starts at the impact point and travels back and forth through the bat, producing cyclic fatigue loading. Stresses in the barrel, taper, and other locations of interest can be assessed in the time domain to capture the stress wave. Curiously, some designs show maximum stress during the returning stress wave, and damping the wave as it initially passes through the structure reduces the stress and enhances durability. How to effectively damp the stress wave and incremental design variations are easily carried out with the use of the virtual prototype. The stresses are compared to material durability limits and the performance can be compared to governing body regulations," he adds. © 2013 Penton Media Inc.
Use <pagebreak /> to create page breaks.